Meet the artist from the second release on Soundkeeper Recordings. The musician behind Equinox and Kay Sa, Markus Schwartz spoke with Soundkeeper Recordings. The following interview was conducted just after the release of Equinox. Thank you to our customers who submitted some very interesting questions for us to ask Markus in this interview. The questions reflected the depth of respect for Markus, the complexity of the music and the performing and recording processes. SR: Your bio says you grew up listening to jazz. Can you remember your first exposure to Haitian music and culture? MS: My first exposure to Haitian music (drumming) was on Halloween eve of 1989. I had been invited by one of my early drumming teachers, Raymond Graham, to check out a Haitian dance class with live drumming, in Oakland, CA. The dance teacher was Blanche Brown, who along with her lead drummer, Johnny Scovel, held dance classes and also had a performing ensemble. I apprenticed myself to the drum ensemble beginning that very evening and stayed with the group for over five years. I would have to say that my first deep immersion into Haitian culture was on my first trip to Haiti, in August of 1992. I was invited by Jean-Raymond Giglio, an amazing percussionist, from the groundbreaking Haitian jazz group Foula, whom I was fortunate enough to meet and study with while he was visiting San Francisco at that time. When he was leaving, Jean-Raymond invited me to come visit him in Haiti. I was initially reluctant, due to political unrest at the time - the first coup d'etat against President Aristide and an international oil embargo against Haiti. Thankfully, I overcame my reservations and went down for a month. That trip altered the course of my life. SR: When did you start playing Haitian drums? Did you learn another instrument first? 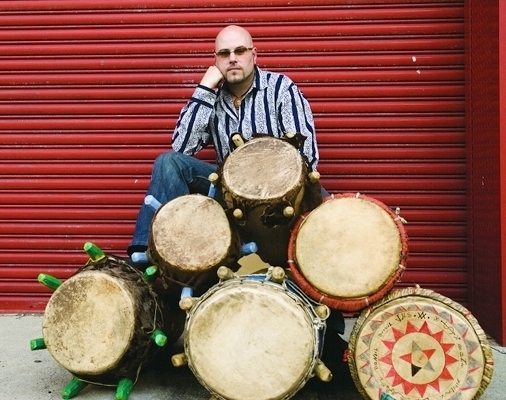 MS: In July of 1988 I began studying a bit of African/Afro-Caribbean hand percussion technique and a few basic rhythms in Amherst, MA with a teacher and drum maker named Joe Platz. This was my introduction to the world of African-based drum music. October 31st, 1989 marked the beginning of my Haitian drum studies, first with Johnny Scovel and Kendrick Freeman and this led to my meeting Jean-Raymond Giglio and Bonga Jean-Baptiste, my first teachers from Haiti. SR: We understand you teach Haitian drums. What would you tell a young musician who is eager to learn this modality as well as learn about the culture? MS: I would tell them that African drum music is a living oral tradition, transmitted directly from teacher to student through doing, not writing. African drumming cannot be fully expressed on paper. I try my best to help my students hear the melodies of the rhythms, the tonality of the drums. Haiti is a tiny country that is incredibly rich and diverse in terms of culture and artistic expression. Specifically with regard to music, dance and song, the Vodou traditions (African-based spirituality in Haiti) are danced, drummed and sung. The song, the dance and the drum (rhythm) are one. A holy trinity of sorts. 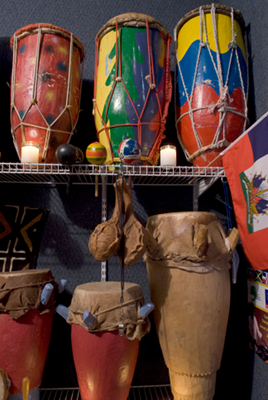 To study the drums of Haiti is to study Haiti's history, her language (Haitian Creole), her food, her spirituality, the DNA of the culture. SR: It’s clear Haitian culture is a part of you. How does the connection shape your life? MS: I think the culture is a part of me and in some small way, I am now a part of it as well. To play any role in the transmission and propagation of Haitian culture is both an honor and a joy. My connections to Haiti are so deep and long standing at this point, that I hardly consider them separately from the totality of who I am as a person. I should point out here that I am not of Haitian descent. However, the mission of my musical expression and my life's work is toward celebrating the beauty and depth of Haitian music and culture. I was once promised a Haitian passport by the former Haitian ambassador to Japan. It hasn't arrived yet. SR: Haitian religious sects are a mixture of African and New World. Do you know how that evolved in the music? MS: In terms of the current popular music in Haiti, which is Konpa and now also rap and ragga in Kreyol which are extremely popular with the youth in Haiti, the "New World" or western/US influences are pretty easily traceable (instrumentation, English words/lyrics, even genre/styles, etc.). With regard to the traditional drum music, which is the music I am primarily involved with, although it is evolving and changing particularly in the urban areas, it still retains its primarily West African identity in terms of polyrhythmic expression, instrumentation and form. One can still encounter traditional music in the Haiti countryside (Rara, Vodou drumming, etc.) which seems as though it has not changed much in the past two hundred years or more! SR: Is there a Haitian drum rhythm you are most fond of? In a few adjectives, how do you describe it as a listener? And as a percussionist, how do you describe the experience of playing it? MS: People often ask me if I have a favorite Haitian rhythm and the answer is that I don't, as it's impossible to single out one above the others. It comes down to a mood or vibe, meaning each rhythm or family of rhythms carries its own feelings and energy, which may be appropriate for, or speak to me in that moment. I seem to fall in love with the rhythms of Haiti over and over again. As I listen or study, I might hear a particularly powerful version of a certain rhythm (Yanvalou, Petwo, Banda, Djouba, Dawomen, Kongo, etc. ), played by a master drummer or group of drummers, with such skill, dexterity, feeling or creativity and in that moment, it's my favorite. But to pick one above the others, I can't! In terms of playing the rhythms, the same principle applies. I can be profoundly inspired by any of these rhythms in the moment of performance. When I get in "the zone" on the drums, it's like flying and nothing feels better. In that moment, whatever rhythm I may happen to be playing is my favorite! The process of teaching also really helps me to revisit and appreciate anew the intricacies and nuances of the various rhythms that I teach. No one person could possibly learn all of the rhythms that exist in Haiti. It's too vast. SR: A conga player I know said he has to "warm them up" before his drums play right. The sound must also change with weather. For example, New England is notorious for destroying instruments that are non-native. How do you maintain the sound? MS: This is very true. Natural animal skins need to be warmed up before they will resonate properly and there is a certain settling that takes place when optimal temperature is reached, in terms of how the head seats on the rim or bearing edge of the drum. The wood itself also is affected by temperature and changes in climate. Maintaining traditional Haitian drums is not easy and requires a lot of care and vigilance as well as an ongoing commitment in terms of upkeep. Traveling with the drums, especially by airplane, and bringing them from one climate to another abruptly can be problematic as well. Haitian drums are typically carved from a single piece of relatively hard wood and the skins are attached either by a system of ropes (for goatskin heads) or pegs (cowskin heads). Tuning the drums means pulling the ropes or banging on the pegs to increase the tension across the head (raising the pitch). Ropes and wooden pegs can and do break, the skins eventually wear out and need to be replaced. The drum shells can develop cracks and even split open, both from temperature and humidity changes, the wood drying out or the drum sustaining damage during travel. However, the sacrifices are all worth it, as these drums have such a beautiful and unique sound. 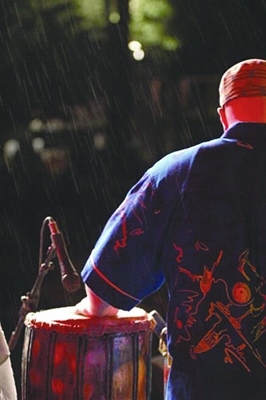 Congas and djembe drums, the two hand drums most often substituted by drummers playing Haitian rhythms, do not sound the same. My drums' sounds are constantly being complimented, by fellow musicians, audience members and sound engineers alike! SR: What artists do you currently like to listen to? MS: At the moment I am in jazz drums listening/study mode. I am checking out some Roy Haynes, Art Blakey, Max Roach, Elvin Jones, Ben Riley, Billy Hart, Art Taylor, Brian Blade, Lewis Nash, John Riley and Jeff Ballard among others. I am enjoying the jazz trio format right now in terms of hearing what the drummers are playing, their touch and dynamics and have been checking out Kenny Barron, Tommy Flanagan, Jim Hall, Harold Mabern, Chet Baker and Brad Meldau recently. My collection of Haitian drum music is always on rotation. Lately I have been listening to the "Mizik Tradisyonel Ayiti" series of CDs on the Crowing Rooster label. SR: Who are your musical influences? MS: In terms of Haitian percussionists, I have been influenced primarily by my teachers, in particular Jean-Raymond Giglio, Bonga Jean-Baptiste and Daniel Brevil. Other master Haitian drummers in and out of Haiti who I have been fortunate to spend time around include Azor, Aboudja and Sera. I have been fortunate to learn from many great Haitian drummers through playing with them, including FanFan Damas Louis, Frisner Augustin, Jean-Marie Brignol, Zilibo and Sergo Decius. American drummers who I have learned from include Joe Platz, Raymond Graham, Johnny Scovel, Kendrick Freeman, John Amira, Steve Deats, Steve White and Lee Hetelson. Certainly I have drawn inspiration and been influenced by working with such Haitian musicians/groups such as Foula, Dadi Beaubrun, Eddy Francois, Emeline Michel and her band, Mozayik, Erol Josue, James Germain, Tiga and Alan Cave among many others. I love and am inspired by Latin percussionists too (Cuba, Puerto Rico, Brazil) and have been inspired by listening to the greats such as Mongo Santamaria, Armando Peraza, Francisco Aguabella, Tata Guines, Changuito, Miguel "Anga" Diaz, Giovanni Hidalgo, Paoli Mejias, Nana Vasconcelos, Airto and so many more. Thanks in large part to my father, who exposed me to jazz from birth, I am influenced by the entire legacy of that music. I love Latin jazz and also Kreyol jazz, of course! I've also been checking out some great music from Guadalupe and Martinique recently, such as Jacques Schwarz-Bart, Mario Canonge, Michel Alibo and Jean-Phillipe Fanfant. I love music that highlights the fact that jazz also has its roots in the Afro-Caribbean traditions. New Orleans was a caribbean port and remains to this day, the most Caribbean city in the U.S..
SR: How do you find the right musicians to play your music? MS: I am fortunate to be surrounded by so many talented musicians, both in and out of the Haitian community. NYC is such a wealth of musical talent, its scary! I have had the privilege to perform with many of Haiti's greatest talents during the past ten years or so and these experiences inspired me to record Tanbou nan Lakou Brooklyn/Haitian Drums in the Brooklyn Yard. That recording, a studio project featuring a vast array of guest artists, led directly to the formation of the Lakou Brooklyn quartet and then to the Equinox recording. SR: Do you like to work in small or large ensembles? Do you have a preference? MS: I tend to prefer smaller ensembles these days when it comes to my own music. I enjoy playing in a larger group as a "sideman" or guest - the energy and sound of a big horn section or a chorus of vocalists is beautiful and I did a gig last year with a big string section that was wonderful. With my own music, I like lots of open space, dynamics and room for the sound of the Haitian drums to really be heard. I am very partial to acoustic instruments and the blend of sounds they create together. The logistics and economics of a small group in today's economy are more manageable as well. SR: What was your vision for the musical pieces on Equinox? Do you feel your vision was realized? MS: I am so happy with the recording. I didn't really know what to expect or how well the band would rise to the challenges of the Soundkeeper recording techniques and limitations with no overdubs or "punches"! I think we came away with a very honest record, that truly reflects the sound and personality of Lakou Brooklyn. The sound of the recording is so unique to my ears and fits the material perfectly. SR: One of our customers wanted me to ask you: What is the thinking and decision making process you went through to come to the conclusion that this is the best way to have your music and passion represented to your standards? MS: Speaking at length with you, listening to your past work on Lift and learning a bit more of your philosophy and approach to recording was really what led me to go ahead and agree to make the recording together. I had a listening session with you in your studio. We spoke on the phone and via email. Over time, I grew more and more excited at the prospect of attempting a recording "without a net" as you put it. I knew the individual players I had assembled were all up to the task, I had complete trust in your ears and instincts and knew it would mostly be a matter of coming together in the right space at the right time, with the right vibe. You suggested the venue (a concert hall built in 1908 in Rye, NY) and I got a chance to perform in the room first on my own (a solo performance with a dancer). So I already had a sense of the acoustics and feel of the room before I brought the band in. The band came and did what turned out to be a trial run; that first session yielded no "keeper" tracks. I think we were all a bit nervous and played too cautiously or tentatively. A week or so later we went back and this time I approached the session much more like a live gig. We already knew how to set up, (knowing stage position and relative distance from the mic are crucial to your process) so we were able to get ready quickly and then relax. We played for about 4 hours or so and this session yielded all of the music on the recording. SR: You've recorded using standard multitrack studio techniques in the past. How did you feel about recording direct to stereo with no overdubs or mixing as you did for Equinox? MS: At first I found the idea daunting! I and most musicians I know am so used to recording with the intention of overdubbing, redoing solos, "fixing" mistakes, using plugins to enhance or alter the sounds after the tracking process, the idea of recording the whole band at once, direct to stereo, with no separate tracks was so foreign to me. When you and I reviewed the takes we had recorded, it took my mind a moment to grasp the possibilities and limitations of editing what we had recorded, as I am so accustomed to "non-linear" editing. In hindsight, the the process seems like such a natural and logical way to make a good recording. It forces the musicians to play with a heightened degree of sensitivity, as we should all the time anyway, since the mix and dynamics are being created inside the performance. The sounds are all blending together, instead of artificial separation, which is not the way our ears hear the music. I am a convert and would love the opportunity to participate in more recordings of this type. I love my Pro Tools LE setup; I recorded my previous CD, Tanbou nan Lakou Brooklyn myself and all the options that a modern recording studio offers but the Soundkeeper method produces results that I don't think could be achieved through multitracking. SR: Is the true nature of your music realized with a direct recording vs. using the more common techniques used in most studios today? MS: Absolutely. The first thing I was struck by was the sound of my drums. I have recorded with them a lot, at some of the best studios in NYC - Avatar, Platinum Sound, Systems II, East Side Sound and many others but close mic'ing them on an isolated track and then mixing them in never produced the final results I hear on Equinox. The sound is so full and accurate, the entire spectrum is there and the blend with the other instruments is perfect. I think the nature and personality of the recording is the perfect compliment to the sound of the band. Each instrument and voice sounds terrific, on its own and together. The recording has a personality all its own. SR: Does the final disc reflect the feeling and the sound you remember occurring in the auditorium during the recording session? MS: It does. Although I think the mic was in a better position than I was in terms of hearing everything in perfect balance, so the "mix" sounds even better than I imagined it would! All of the musicians are so happy with the sound of the recording and the sounds of their instruments. It is a very truthful recording. A fan contacted me the day after our release party at the Iridium Club in Manhattan, where they had attended the live show and picked up the CD. They said "I have been listening to the CD all day. It sounds just like the band did last night, only better!" SR: Thank you Markus, for making a record with Soundkeeper Recordings and for being so bold to try our "recording without a net" approach to making records. MS: It was an honor Barry. Thank you so much for offering to work with me and for producing such a beautiful sounding recording of Lakou Brooklyn.